Dogfish Diets and the Influence of Holden – Ya Like Dags? I can never get enough of this picture. Photo by Andy Murch. As always, I have spiny dogfish and what they’re eating on the brain, and the Menhaden of History post over at Southern Fried Science and Kevin Z’s challenge to the marine blogosphere got me thinking about the papers that have helped form my own meager contributions to the field of shark puke analysis. So today I’m going to try my hand at a little research blogging. In order to get to the classic papers of shark diet analysis, you’ll have to go back to the 1960s when just about all the work was done on small, common, easily captured species of cat sharks and dogfish. One paper from 1966 by M.J. Holden pretty much set the bar for the study of the diets of spiny dogfish, and was thorough enough that it’s been referenced in nearly every paper since that deals with spiny dogfish feeding, and is cited in several papers and reviews on shark diets in general. Much like modern diet studies (including mine), Holden’s (1966) was motivated by fisheries. In particular he wanted to address the impact of dogfish predation on herring in British waters. To accomplish this 1,080 dogfish were captured by various methods, including the use of commercial trawlers and longliners. Interestingly, only frequency of occurrence was used in the analysis, though this makes sense in light of the fact that all Holden was trying to find was whether dogfish showed a preference for a particular species. Basically the species showing up in the majority of stomachs was determined to be the preferred prey. The results found by Holden showed spiny dogfish in British waters to be extremely generalist feeders. Sand eels seemed to be the most common prey species, and in most cases the preferred prey were not commercially important. Most interesting for my research is the extent to which Holden went about identifying species, using scales and skeleton fragments if necessary. I’m shooting for this much detail with my own work and it gets pretty intense. Also important was the finding that spiny dogfish are intermittent feeders, eating to satiation then holding off on feeding until the food already in the stomach is completely digested. This has been backed up thoroughly in the literature ever since and is generally accepted as true for most sharks. One important thing Holden attempted was to mathematically determine the food requirements of spiny dogfish, finding that the total Scottish-Norwegian stock would consume 277,000 tons of food a year. While this seems like a lot, it really comes down to 1.8 kg of food for a 1 kg dogfish. This was backed up by Brett and Blackburn (1978), who determined spiny dogfish metabolism is on the low end of the elasmobranch spectrum and that a dogfish really only needs to consume 1.5-2 times its body weight per year for routine metabolism. Hannan (2009), however, found evidence of a significantly higher metabolic rate in spiny dogfish, though her sharks were relatively young and some shark species show higher metabolism in their early years. In any case, the combination of dietary preference and food requirement goes a long way towards determining the predatory impact on individual species. If there’s one limitation of Holden’s paper, it’s that it doesn’t go far enough down this road: he had a decent idea of the dietary needs of British spiny dogfish and the ratio of species in the diet, he just didn’t break up that stock-wide consumption rate by species. This could be because of the highly generalist diet he observed in his samples of spiny dogfish. 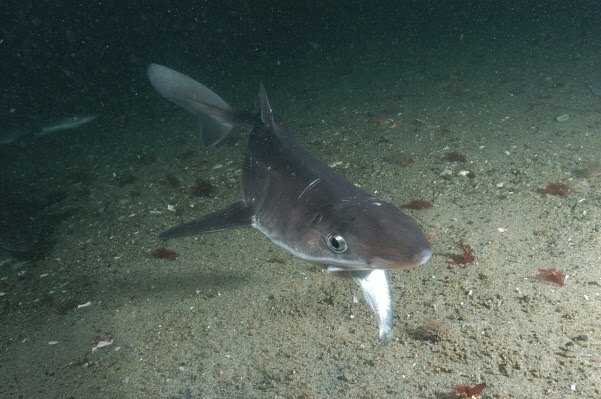 Holden’s sampling method brought in dogfish from several different areas within British waters, and from at least two stocks, so he was able to compare the diets and determined that the spiny dogfish is “an indiscriminate predator preying upon those species that are abundant and available in the area.” Other researchers have taken this idea and run with it, going as far as to use presence and abundance within spiny dogfish stomachs as a proxy for relative abundance in the marine community. Link and Ford (2006) used spiny dogfish stomach contents to show an increase in abundance of ctenophores on the U.S. east coast, though this method raises the question as to whether ctenophore abundance has truly increased or spiny dogfish are just consuming more ctenophores. Holden’s work was very thorough for its time, and really set the tone for most subsequent diet studies on spiny dogfish and other sharks. His findings have been well-supported by more current literature, to the point where the assumptions supported by his work can be more or less accepted (though it should be obvious that using spiny dogfish as living trawl surveys is potentially problematic). Brett, J.R., and J.M. Blackburn, 1978. Metabolic Rate and Energy Expenditure of the Spiny Dogfish Squalus acanthias. Journal of the Fisheries Research Board of Canada 35:816-821. Hannan, K. 2009. Determination of gastric evacuation rate for immature spiny dogfish. Pages 253-258 in V.F. Gallucci, G.A. McFarlane, and G.G. Bargman, editors. Biology and management of dogfish sharks. American Fisheries Society, Bethesda, Maryland. Holden, M.J. 1966. The Food of the Spurdog Squalus acanthias. Journal du Consiel Perm. Int. Explor. Mer. 30: 255-266. J.S. Link and M.D. Ford. 2006. Widespread and persistent increase of Ctenophora in the continental shelf ecosystem off NE USA. Marine Ecology Progress Series 320: 153-159.